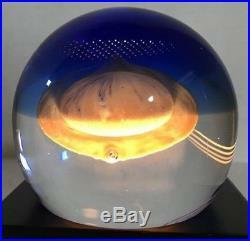 VTG Gravitation Caithness Glass Paperweight Design Alastair Maclntosh. 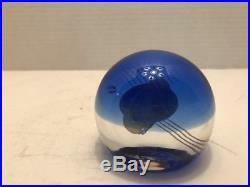 This is a gorgeous glass paperweight, produced by Caithness Glass. 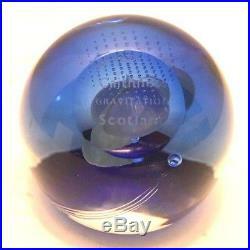 It has in the bottom the inscription “301/750 Caithness Gravitation Scotland”. 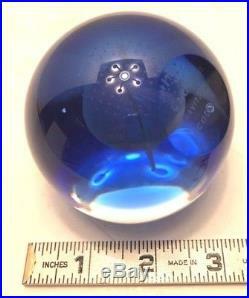 It has beautiful blue color. Perfect gift for the Holidays. Please see photos for more details. Feel free to ask me any questions about this item. This item does not come with the light stand. This item does have the original box. About the Caithness Glass Company. Since 1961 Caithness Glass has established a proud tradition of fine glass-making. At the original site in the far north of Scotland they initially produced coloured vases and bowls in contemporary, popular styles, and in 1968 we were granted a Royal Warrant by Her Majesty Queen Elizabeth the Queen Mother. 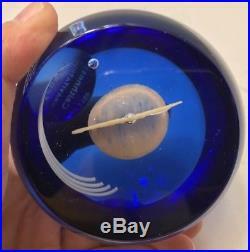 The following year saw the introduction of the first Caithness Glass limited edition paperweights,’The Planets Set’, designed by Colin Terris. These ground-breaking abstract creations, and others that quickly followed, succeeded in thrusting Caithness Glass to the forefront of modern paperweight design. 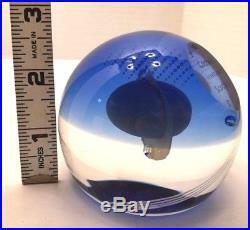 We do have the best prices / deals in antiques and collectibles. Message me to make an offer! 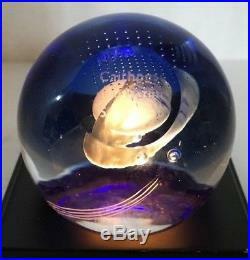 The item “VTG Gravitation Caithness Glass Paperweight Design Alastair Maclntosh 301/750″ is in sale since Monday, November 20, 2017. 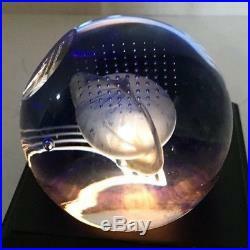 This item is in the category “Pottery & Glass\Glass\Art Glass\British\Caithness”. The seller is “ohiostamp” and is located in Northwood, Ohio. This item can be shipped to United States, Canada, United Kingdom, Denmark, Romania, Slovakia, Bulgaria, Czech republic, Finland, Hungary, Latvia, Lithuania, Malta, Estonia, Australia, Greece, Portugal, Cyprus, Slovenia, Japan, China, Sweden, South Korea, Indonesia, Taiwan, South africa, Thailand, Belgium, France, Hong Kong, Ireland, Netherlands, Poland, Spain, Italy, Germany, Austria, Russian federation, Israel, Mexico, New Zealand, Philippines, Singapore, Switzerland, Norway, Saudi arabia, Ukraine, United arab emirates, Qatar, Kuwait, Bahrain, Croatia, Malaysia, Brazil, Chile, Colombia, Costa rica, Dominican republic, Panama, Trinidad and tobago, Guatemala, El salvador, Honduras, Jamaica, Antigua and barbuda, Aruba, Belize, Dominica, Grenada, Saint kitts and nevis, Saint lucia, Montserrat, Turks and caicos islands, Barbados, Bangladesh, Bermuda, Brunei darussalam, Bolivia, Ecuador, Egypt, French guiana, Guernsey, Gibraltar, Guadeloupe, Iceland, Jersey, Jordan, Cambodia, Cayman islands, Liechtenstein, Sri lanka, Luxembourg, Monaco, Macao, Martinique, Maldives, Nicaragua, Oman, Peru, Pakistan, Paraguay, Reunion.